SINGAPORE - US President Donald Trump's cancellation of his June 12 summit with North Korean leader Kim Jong-un in Singapore threw cold water on civil servants and people in the hotel industry here who had been preparing for the historic event. Singapore had already begun press accreditation to register foreign journalists wishing to cover the summit. Hotels which had blocked off or taken back rooms that were allocated to tour agencies in anticipation of a hike in visitors around the summit period returned the rooms to the agencies. Police officers were told on Friday they are now free to apply for leave around June 12. The Singaporean government also expressed its regret on the cancellation. "Singapore regrets that the scheduled summit between President of the United States Donald J Trump and Democratic People's Republic of Korea State Affairs Commission Chairman Kim Jong-un will no longer take place on 12 June, 2018," a spokesperson of the country's Ministry of Foreign Affairs said in response to media queries. "Singapore hopes that the dialogue and efforts to find lasting peace and stability on the Korean Peninsula will continue." In a letter addressed to Kim and posted on the White House website on Thursday, Trump said he was calling off the summit based on the North's "tremendous anger and open hostility" displayed in its most recent statement. 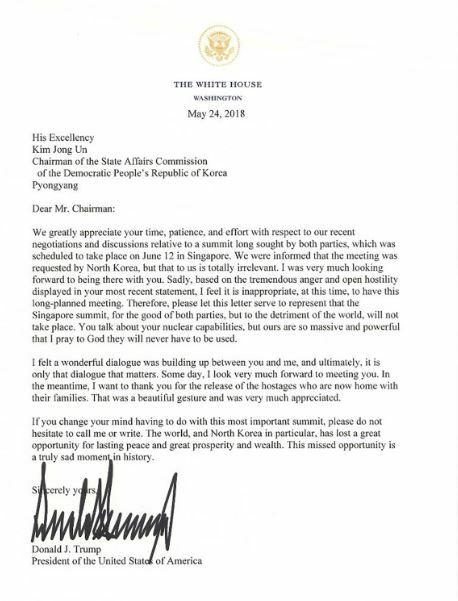 "I was shocked by Trump's letter especially since it was published on the same day as the dismantlement of the Punggye-ri nuclear test site and just two days after his summit with President Moon Jae-in," Shawn Ho, an associate research fellow at the S. Rajaratnam School of International Studies in Singapore, told The Korea Herald. "Trump said in his press briefing the summit could still happen. North Korea also said in its latest statement that it wants the summit to be held. I think we should wait for the next 24 hours to see the next reaction from Trump to get a clearer idea of whether the summit is really postponed or cancelled." Some Singaporeans said they weren't surprised. "I'd actually expected it to happen because I felt the progress seemed too good to be true. I have no doubt that the inter-Korean meeting was held in good intentions, and perhaps Kim really liked Moon for the effort that he is putting in, but it's too much of a great leap to meet with Trump," said private tutor Amanda Toh. "The way the media was portraying everything after the inter-Korean summit felt very premature. It is not hard to shake hands and cross the border, but to denuclearize is something else entirely. I think Trump was afraid the outcome of the summit wouldn't be what the public expected, so he cancelled it." Elizabeth Tan wrote in a comment to a related news article: "I'm not surprised by the sudden decision from one of the world's most unpredictable leaders who had cancelled, among others, the TPP deal and Paris climate agreement." When Chien Cheng wrote: "Better for US to pull the plug to see how sincere North Korea is. The North has a history of pulling out last minute. It is just a standard negotiation tactic from US to see how badly North Korea wants this." Tania Lindsay-Jean, an American resident in Singapore, said: "I'm actually quite relieved it's not going to happen. Not only was it going to be a nightmare in terms of traffic, but Trump would have gotten credit for the summit when it was just the result of being in the right place at the right time."